I am not sure if I want to write anything about design today. I am not in the mood for anything since my Nio Nio passed away. She was my only family in the United Stats, and after she's gone I never felt so lonely and alone in this country before. I tried to make my self preoccupied so I won't think about her so much. This weekend I reorganized my website and updated my portfolio. This project at least helped time gone fast, when life without Nio Nio's company. 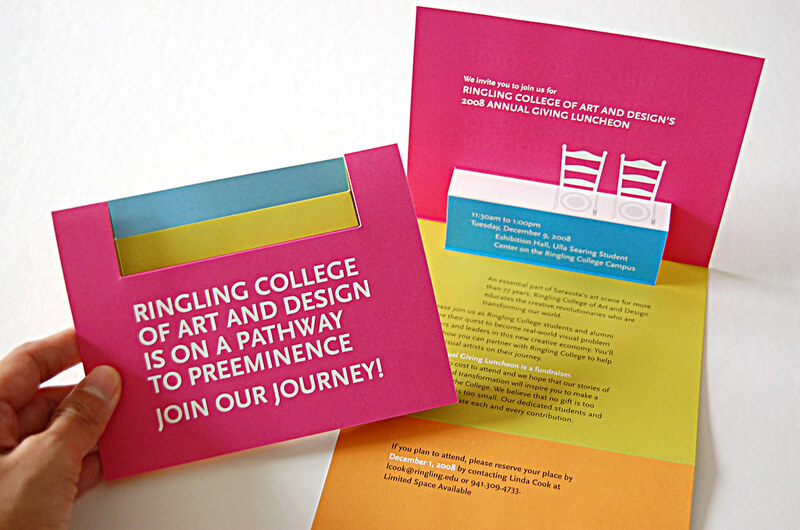 The invitation design above is the latest project I've done for a fundraiser luncheon for Ringling College of Art and Design. The die-cut and folds create a pop-up dining table when the card opened. This idea was initially proposed for another project Town Hall Platinum Dinner. However, the client from the Town Hall chose the rather conventional concept instead. I was disappointed. Then this fundraiser project came up and I thought this dining table concept would be even more appropriate for it. There were some unexpected issues during the printing process and the other fun concept was eliminated; but I am still very happy with the over all result, so does my client. I have an idea book that collects all my eliminated ideas. I call it idea recycle bin. If an idea was not chosen for this client, it might be the way it meant to be because it probably will be more suitable for my next project and client. It's also an inspiration for more new ideas. See more about this design here.